Figure 2. 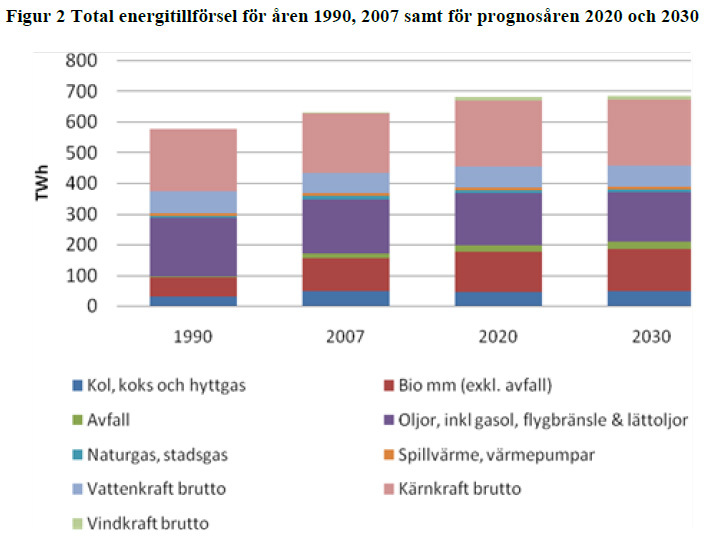 Energy supply for the years 1990, 2007 and for the prognosis years 2020 and 2030. When one studies Figure 2 one can be amazed that the difference between 2020 and 2007 is very marginal. Energy from biofuels and combustion of waste increases a little and windpower has only a small impact in 2030. For the rest there are no radical changes. The reason that I am looking for Sweden’s future energy prognosis is that the IEA has just published a report on Sweden in its series, “Energy Policies of IEA Countries”. (Read the report, http://www.iea.org/textbase/nppdf/free/2013/sweden2013_excerpt.pdf) If one wants to buy a PDF version of the report it costs €60 but there is a free chapter that can be downloaded. In that chapter exists “Figure 6” that is a detailed version of the figure presented by the Energy Authority in 2011. Despite some apparent differences, the trends are the same. Wind increases a little, solar is negligible, hydroelectricity is constant while nuclear energy is to grow. Bioenergy grows, coal increases a little, natural gas and peat are almost negligible while oil consumption is expected to hold constant. These figures have also been given by the Energy Authority. With all the public discussion that have we have had about changing our energy system one would have thought that the Energy Authority would have presented something else. 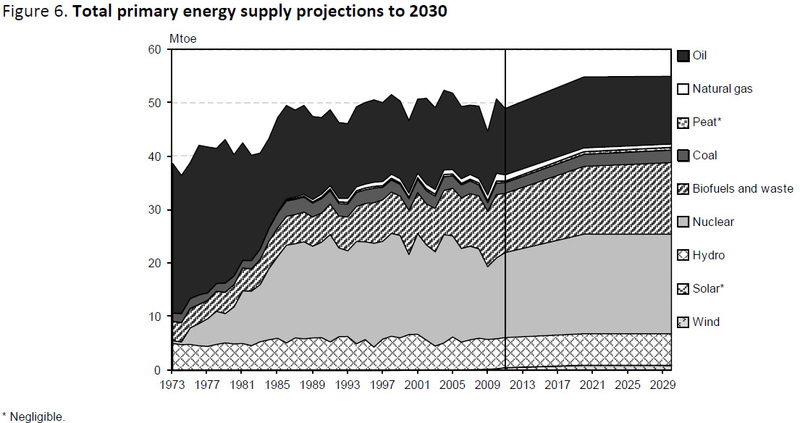 When I read the text that describes the future I am amazed that I find the following, “The reference scenario assumes that new nuclear will replace existing reactors after 60 years of operation.” I presume that oil consumption in 2030 will mainly be used for transport, i.e. no change compared to today’s consumption pattern. Today Sweden imports oil from, above all, three nations, Russia, Norway and Denmark. In 2030 Danish oil production will be far below what they themselves need while Norway’s production will decrease dramatically and the question is how much they will be able to export to Sweden. The IEA considers that Russian production will decrease by 20% by 2030. That is 2 million barrels per day. We raised this issue in a research report in 2009, but the Energy Authority dismissed it. Now that the IEA has published its report on Sweden’s future energy use this should be a strong signal that it is time to take up this issue again.